The Enthusiastic Sportsman oil on canvas Condition: Fine condition, very minor scattered in-painting recently cleaned by Tom Yost. In a period gilt frame. 10 x 11 ½ inches Robert William Buss was known for his amusing subjects. His years of training first as an engraver and later as illustrator, miniaturist and portraitist are showcased in The Enthusiastic Sportsman. A Dickens' enthusiast, Buss delighted in supplying several illustrations for the renowned author's book, The Pickwick Papers. Buss, like many other Victorian artists, painted caricatures of the English gentry. This genre was pioneered by William Hogarth in the late eighteenth century in his series of paintings titled The Rake's Progress. 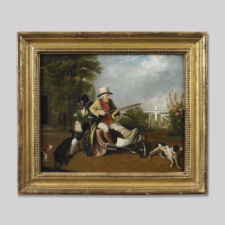 In Buss's painting, The Enthusiastic Sportsman, an injured elderly gentleman, accompanied by his hunting dogs, is so anxious to go shooting on opening day that he insists that his servant push him in a bicycle-like contraption - with lame leg and rifle cocked - to the hunt.